Caramel Papua Mousse, Santa Domingo Foam, Passion Fruit Curd, Thai Spice sponge, Pain D’epice, Caramel Glacage, Croquant wafer. 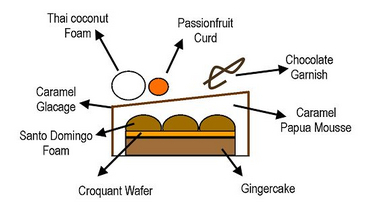 Main component is the caramel Papua mousse. To get the full flavour characteristic of the Santa Domingo but the texture as light as possible it was mixed with a little syrup and put through a siphon. Passion fruit curd gives the entremet the required acidity married to the fruity taste of the Santa Domingo. Coconut, lemon grass & kaffir lime give the flavour of Thai curry, which is whipped gelatine foam. The base is pain d’epice and the croquant gives a crunchy texture. 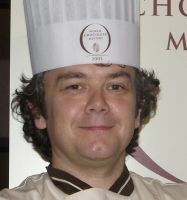 Pastry made at the World Chocolate Masters 2005 Finals in France.